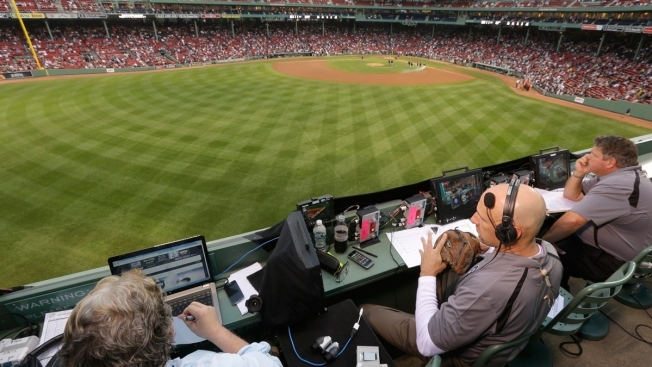 In this Aug. 3, 2014, file photo, ESPN television broadcasters prepare to cover a baseball game between the New York Yankees and the Boston Red Sox from the top of the Green Monster at Fenway Park, moments before the game, in Boston. ESPN plans to announce it will move up the starting time of the nationally televised game by one hour, with the first pitch planned for shortly after 7 p.m. EDT. The network intends to make the announcement on Monday, Dec. 10, 2018, at the winter meetings, a person familiar with the decision told The Associated Press. The person spoke on condition of anonymity Sunday because the announcement had not yet been made. Baseball players may get a little more sleep when traveling after Sunday night games next year.